Remembering the past is important for many reasons, including preventing horrific events from occurring again. The year 2017 marks 40 years since the deadliest accident in all of aviation history. It occurred on March 27,1977 on the tiny island of Tenerife, part of the Spanish-controlled Canary Islands located off the coast of West Africa. How Did the Tenerife Accident Happen? The Tenerife airline disaster didn’t occur in the sky. It wasn’t an act of terrorism or some massive loss of engine failure or a technical glitch. Instead, it happened on the ground, when two jumbo jets collided on the runway. Both jets were 747s — one a Dutch KLM aircraft, and the other an American Pan Am flight. In total, 583 people were killed. There were just 61 survivors. According to Patrick Smith, a commercial airline pilot who has written extensively about the disaster, a combination of things contributed to the catastrophic accident. Both jets should have never been on Tenerife in the first place. Instead, they were diverted there when a terrorist’s bomb exploded at the main airport for the Canary Islands. Both planes were forced to wait for hours while a dense fog swirled around the island and runway. The runway wasn’t used very often, which may have played a role in the crash, as the pilots were unfamiliar with it. At some point, the air traffic control tower told the KLM flight to taxi to the end of the runway. It gave instructions to the Pan Am flight to follow behind the KLM plane. When the KLM pilots got into position, they notified the tower over the radio that they were ready to takeoff. However, the Pan Am flight was still on the runway. Radio interference meant that the KLM pilots didn’t hear the Pan Am crew warning them their plane was in the way. The KLM pilot sped down the runway and crashed into the Pan Am plane. The KLM plane tore the top of the Pan Am jet off, and both planes burst into flames. Everyone on board the KLM plane was killed. There were 61 survivors on the Pan Am flight, including the flight crew. Smith says these causes include runway congestion, air traffic control communication problems, and pilot error. All of these issues played a role in the Tenerife disaster. 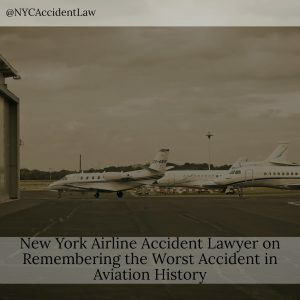 If you’ve been injured in an aviation accident, or you have lost a loved one in an airline crash, contact a New York City airline accident lawyer about your right to receive compensation. New York Aviation Lawyer Jonathan C. Reiter. T: 212-736-0979.